We are here to help make sure you have the right personal watercraft insurance in place, which will ensure you peace of mind while you're out enjoying the perfect ocean weather and riding the continuous waves. 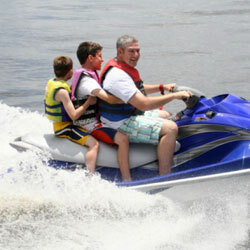 Personal watercraft insurance is also referred to as PWC or personal watercraft coverage and it can insure a Jet Ski, Wave-Runner, Sea-Doo or other personal watercraft (PWC). Personal watercraft insurance will provide protection for your watercraft through coverage for collision, theft, vandalism, and damage caused by uninsured or underinsured boaters. It also includes protection for you and others through coverage for bodily injury, property damage, medical payments, uninsured or underinsured boaters, and guest passenger liability. Additional optional coverage includes on-water towing, labor and trailer coverage. Call us now to request your Personal Watercraft Insurance quote proposal from an agency that strives to consistently provide our customers with superior coverage, service and savings.